At nearby Vanport the only mama I saw had just one duckling. Driving away from Force Lake right by the Expo Center, something caught my eye on the side of the road. I stopped and looked back and there sitting in the road was a silly little duckling. The curb was too high for it to get over so it was somewhat trapped. I will admit that I am not sure what I did was right, but at the time it seemed like the right thing to do. I put my hazards on and decided to try to catch it. It took a few minutes with cars spooking it and me spooking it.. But finally I caught him. I named him Ted and stood there holding him wondering what I should do next. The nearest water was in Vanport, but it's surrounded by a chain-link fence. I wasn't sure that shoving Ted through the fence would help him survive. 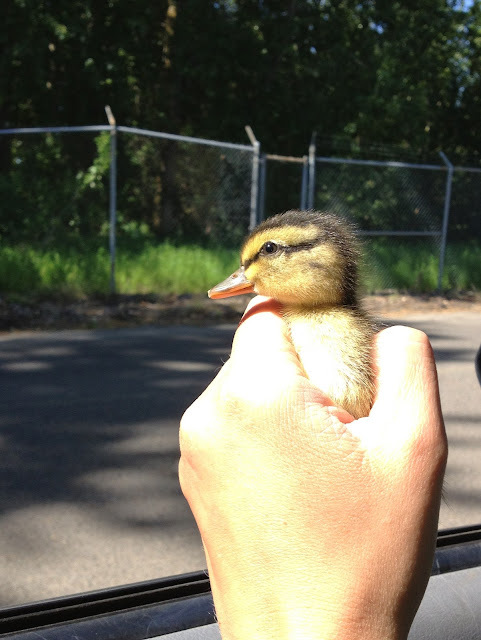 I remembered the ducklings at Force Lake, which was also pretty close, and so drove back over clutching Ted in my hand. I did some one-handed googling and learned that if the Force Lake duck mama was in fact Ted's mama, then she would probably respond to his peeping and come get him. So I waded through the tall grass and placed him beside the water in a spot where I could see the mama. Then I waited. At first mama did not get up (she was sunbathing), but after a few minutes I saw the family hop in the lake and start swimming towards Ted. I was stoked! Mama was coming for Ted. I peeked over the stone wall and saw Ted happily join the other ducklings. Unfortunately then I realized that Ted was a bit younger than the others, and obviously not a blood relative. I started to stress out that she was going to murder him in front of me, but that didn't happen. She poked him some more and he kept coming back. The other ducklings seemed fine with having him around and eventually they all just swam off together. So I am not sure what will happen with Ted and his new adopted mother and siblings. I am hoping for the best, but realize that things might not end well for him. I plan to go back later this afternoon to check on them so I'll hopefully have an update. Interesting times! Welcome home....awww I really hope TED gets adopted...IVE seen other ducklings who cant manage a curb! Dang roads are a hazard for them. I spoke to my Mom this morning, she is still in COLORADO...she said to celebrate Mother's Day she is going for a Banana SPLIT..wow why didnt i think of that. Ted strikes me as a Wood Duck with his wide (from profile view) and very yellow head. Are there Wood Ducks around at that location? In any case, I'm sure it will all work out for little Ted. I didn't see any Wood Ducks around there, but I have seen them in the slough next to the raceway in the past. Great, even more reason for that Mallard to kill him! Wow, what a story. I hope the cute ducklings survives. Cute photos, Jen. 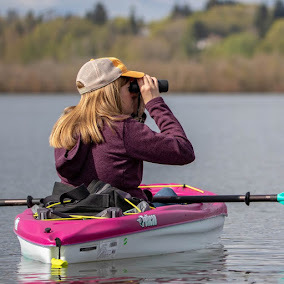 What a Mother's Day story and adventure! Good luck Ted!